America’s favorite pastime is as popular as ever on the South Side, but unkempt and dangerous baseball facilities at Baran Park, 2600 S. Chase Ave., have raised ire among parents and local officials. 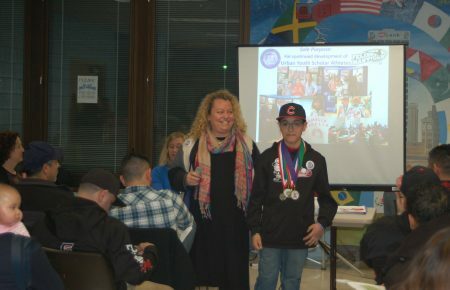 A recent town hall meeting attracted a sea of young people outfitted in identical baseball caps and a crowd of community members to react to a proposal brought by Journey House and Milwaukee County Parks. The proposal’s primary features are a $2.3 million baseball field enhancement, funded through private investment raised by Journey House, and priority park use by Journey House Youth Athletics participants, including the Felix Mantilla Little League and Journey House Scholar Athletes. The meeting, hosted by District 4 Supervisor Marina Dimitrijevic, took place at the Kosciuszko Community Center. The project goal, as described by Journey House Executive Director Michele Bria, is to take dilapidated urban infrastructure and transform it into a beautiful neighborhood park. Doshin Rivera, 11, echoed Bria’s observations on the state of the park, where he and his twin brother have played baseball since the age of 6. Rivera recalled occasions when the fence surrounding the field was locked, resulting in scrapes and bruises when he and his teammates climbed over it to attend scheduled practices and games. Twelve-year-old Lisette Contreras, who was 4 when she first picked up a bat, said she hopes park improvements will be a boon to a new crop of players. Why, many attendees wondered, has Baran Park become so unsightly and potentially dangerous? Anne Rivera, mother of Doshin, directed her concerns to John Dargle Jr., director of Milwaukee County parks. Dargle pointed to problems with job cuts, but did not respond directly to questions about specific safety concerns. Everyone who addressed the crowd ultimately supported the endeavor. Pablo Llanos, a leader of Liga Latina de Beisbol en Milwaukee, said his players also should have access to the improved facilities. Bria and Eugene Manzanet, chairman of the Journey House board of directors, reassured Llanos that they are committed to affordable pricing. Facility reservations will now be processed through Journey House rather than the county parks division. Manzanet, who has played baseball at Baran Park for the past 11 years, thanked the Mantilla family and all who attended the town hall meeting for their support. I believe Baran Park is an old municipal ash fill site that was turned into a park. Care is needed during restoration. I played there as a child in the 60s. My Uncle planted some of the early trees during the park’s development as a County Parks worker.